The white whale known as NOC used its nasal passages to make humanlike sounds. The noise sounds like the kind of "dum-diddy-dah" tune folks might sing to themselves while they're strolling along the beach — but it's actually the voice of a white beluga whale, mimicking human conversation by blurping air through its blowhole. The strange case of the whale named NOC marks the first time that scientists could study a marine mammal in the very act of "talking" like a human, using a most unhuman method. "I think he was looking for feedback," Sam Ridgway, president of the National Marine Mammal Foundation, told me. "These animals make a lot of sound, and they like feedback." Seven years later, the researchers noticed that NOC spontaneously started making unusual sounds — "as if two people were conversing in the distance just out of range for our understanding," they reported in the journal Current Biology. One time, a diver came to the surface outside NOC's enclosure and asked his colleagues, "Who told me to get out?" They soon concluded it was the whale, which must have been saying "Out, out, out." That led Ridgway and other researchers to make a series of recordings of NOC's sounds, at the surface and underwater. They found that the pitch and the amplitude rhythm was similar to human speech. "Whale voice prints were similar to human voice and unlike the whale's usual sounds," Ridgway said in a news release. "The sounds we heard were clearly an example of vocal learning by the white whale." A team of marine biologists from San Diego are saying the audio recordings of a white whale named Noc, which they studied for three decades, prove he had the unique ability to lower his pitch to mimic the sounds of human voices. NBC's Mara Schiavocampo reports. Although this was way out of the norm for whales, it's not unheard of: Back in the 1940s, biologists reported that whale calls could occasionally sound like the voices of children shouting in the distance. 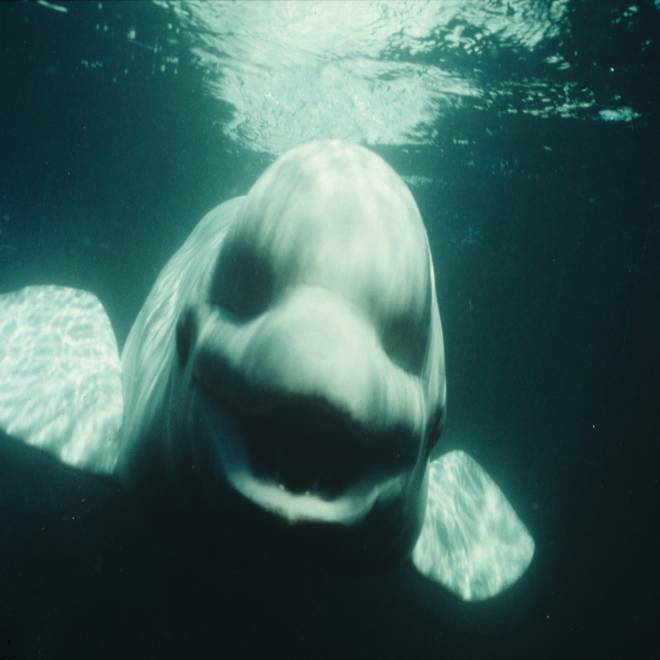 In the 1970s, there was a beluga whale at the Vancouver Aquarium that could reportedly make sounds like garbled Russian or Chinese, and even say his name ("Lugosi"). However, NOC afforded the first opportunity to study scientifically how a whale could make such sounds. The San Diego researchers hooked up pressure sensors inside and just above NOC's nasal cavity. The readings suggested that the whale varied the air pressure inside the nasal tract, expelling air through vibrating phonic lips to make the kinds of sounds that come from a human's vocal cords. In short, the whale had figured out an alien way to talk like a human. "We do not claim that our whale was a good mimic compared to such well-known mimics as parrots or mynah birds," the researchers write. "However, the sonic behavior we observed is an example of vocal learning by the white whale. It seems likely that NOC's close association with humans played a role in how often he employed his human voice, as well as in its quality." About four years after NOC started talking like a human, he stopped. The whale continued to vocalize, but those sounds were just the typical whistles, squawks, rasps, yelps and barks. In 1999, NOC died. "We never got his best speech imitation" on tape, Ridgway said — but the existing recordings were more than enough to set the researcher thinking about the potential. "Whether or not the whale knows what he's saying, other than mimicking what he heard, probably should be explored further," Ridgway told me. "Certainly I think there's a lot we could learn about their sound production. What we'd like, primarily, is for them to tell us how they interact with their ocean environment. How deep can you dive? How long can you stay underwater? What frequencies can you hear? Can you hear the same sounds at the surface and at depth? Describe what you observe with your sonar." Japanese researchers are already working on a dolphin speech translator. Maybe a talking whale isn't that far behind. But what would the dolphins and the whales tell us? "Thanks for all the fish"? Or "thanks for nothing, you damn dirty humans"? In addition to Ridgway, the authors of "Spontaneous Human Speech Mimicry by a Cetacean" include Donald Carder, Michelle Jeffries and Mark Todd.